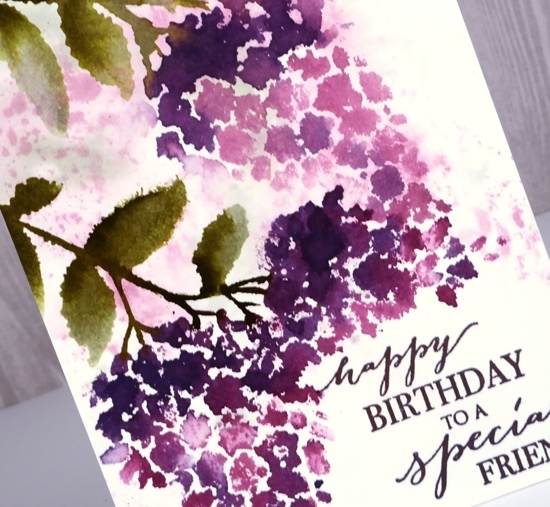 Rather than dob stain on the stamp with the dauber I sprayed some stain into a palette and painted it on to the ‘lilacs’ stamp with a watercolour brush. I used bundled sage and forest moss on the leaves and seedless preserves and dusty concord on the petals. 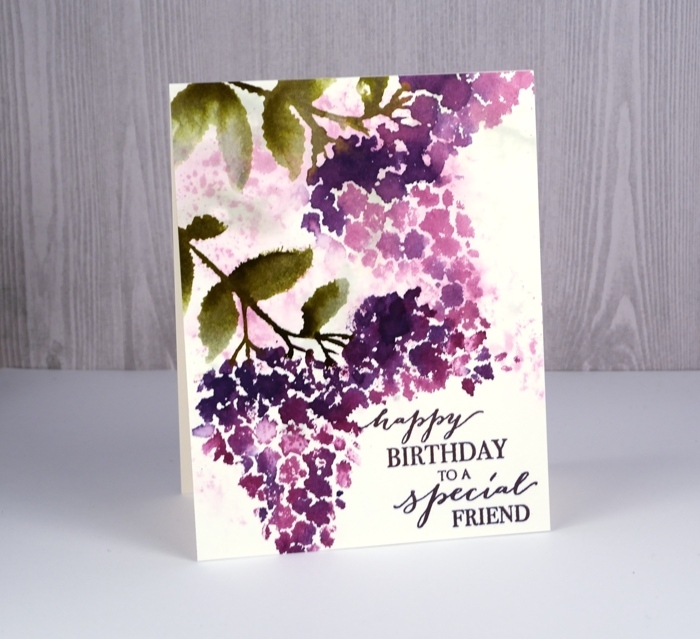 There are some pale lilacs in the background; I stamped them first by painting stain (bundled sage and seedless preserves) onto the stamp and stamping it on a wet piece of hot pressed watercolour paper. I just stamped randomly to spread some colour around then pressed a paper towel over the panel to remove excess water and colour. I dried the panel completely then transferred it to my stamping platform so I could stamp one colour at a time. I painted seedless preserves stain on the stamp first and stamped onto my panel. Without cleaning the stamp I added some dusty concord to a few areas on the stamp and stamped again. The stain blended both on the stamp and on the paper. I cleaned the stamp and used the same technique for the leaves, bundled sage first then forest moss in a few areas to create shadow and depth to the image. To add another couple of flowers I repeated the process described above after repositioning the panel. I added a sentiment from the new ‘grateful heart’ set with imperial purple versafine ink. Thanks for dropping by and thanks for all your encouragement. Gorgeous. 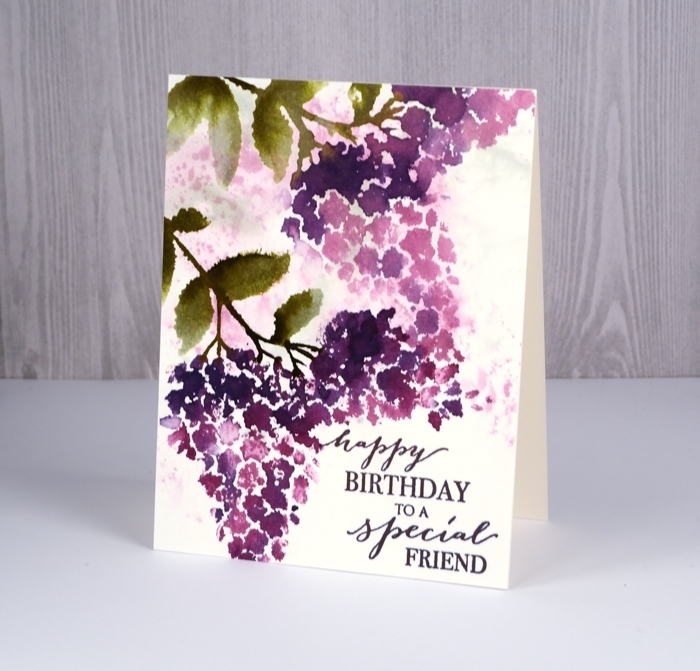 I love what you do with PB brushstroke stamps Heather. The colours are lovely. Wish there were signs of Spring here : snow again today. It’s stunning, simply stunning. I love the intensity to the lightness of the colors. Fabulous result! Gorgeous card with incredible coloring!